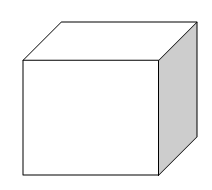 A cube is three-dimensional figure, having 8 corner, 6 surfaces and 12 edges. A dice is three-dimensional figure with 6 surfaces. It may be in the form of a cube or a cuboid. 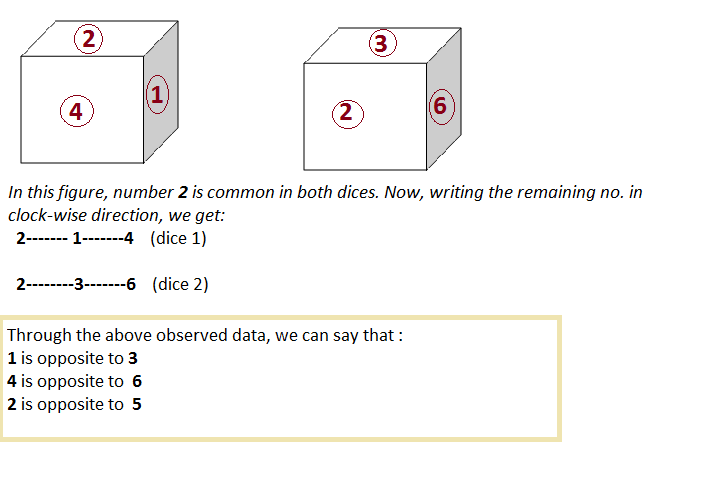 After observing these figures, we have to find the different side( opposite or adjacent sides) of the dice. There are two types of Dice. 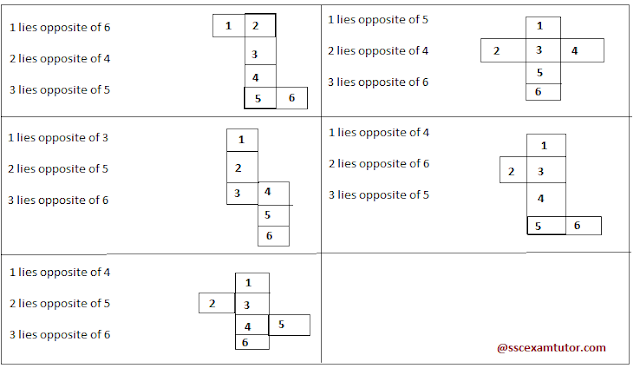 Ordinary Dice : In this type of dice, the sum of opposite sides is not 7 but the sum of two adjacent sides are seven. 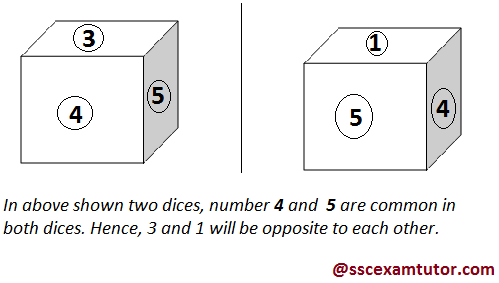 Standard Dice: In such type of dice, the sum of opposite sides is 7 or sum of adjacent side is not 7. 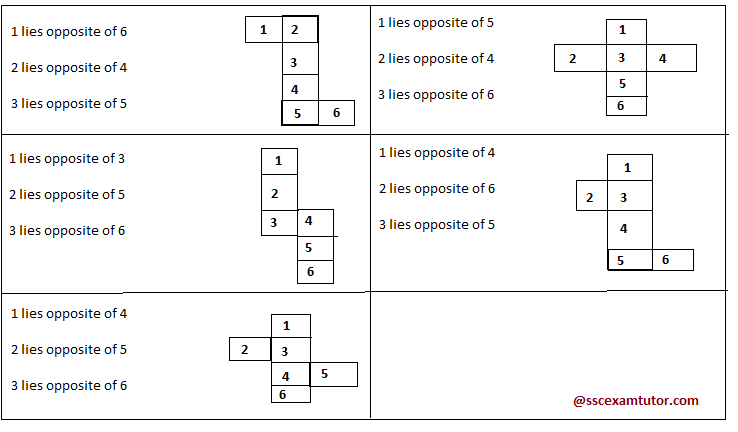 Rule- 1 : : If two sides of cubes are common( has same numbers or symbols), then the remaining two will be opposites of each other. 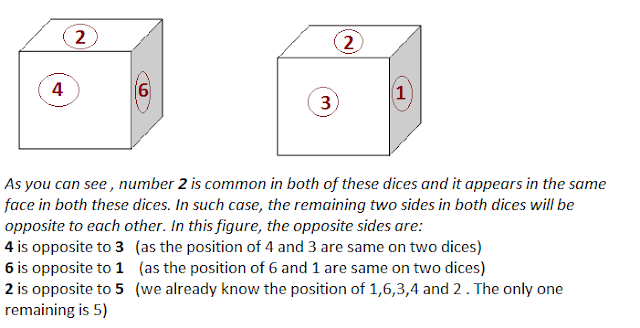 Rule 3: If one side is common and it's place is same in both dices. 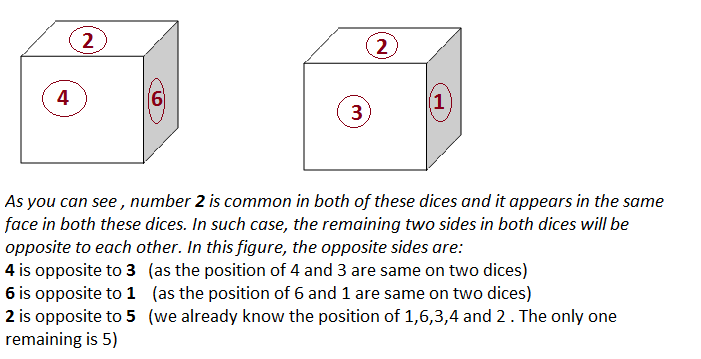 If one side is common in both cubes and it's place is same in both of these dices, then the remaining two sides of respective dices which appear in figure will be the opposite of each other. See figure for understanding this rule. Using the above rules, you would be able to solve all questions based on Dice and Cubes. However, If still have any doubt or query, feel free to ask by posting comments.